In the end, it was like a punch in the gut. After notching two impressive victories to reach the Mid-State Conference tournament championship game, Boone Central/Newman Grove came up just short of the title with an agonizing 63-62 double-overtime loss to #8 seed Pierce Saturday at Northeast Community College. Pierce (7-11), which needed to win a ‘play-in’ game just to reach the regular tournament bracket, made a late surge to send the game to overtime and finally ended the contest with a 3-point dagger in the final seconds of the second extra period. BCNG, meanwhile, was left to rue a number of missed opportunities to collect the ‘W’ and conference championship. Saturday’s contest was everything a title game should be. Pierce got the early jump, sinking a trio of first-period 3-pointers and leading 29-22 at halftime despite the heroics of Cardinal senior Carter Henry, who scored 18 of BCNG’s 22 points. BCNG began to hit its stride following intermission and Ryan Kramer’s 3-pointer knotted the score 37-37 at the end of the third quarter. 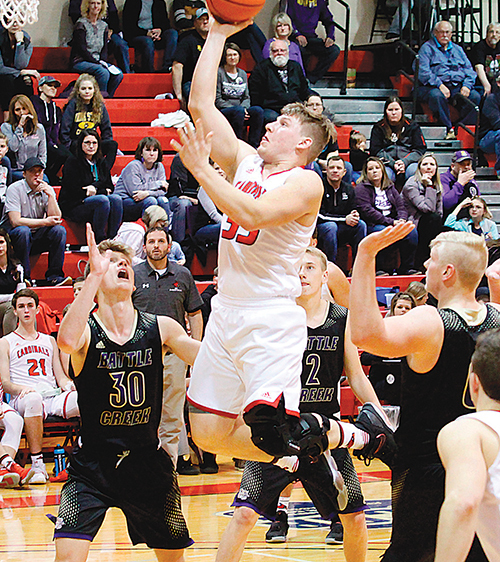 The Cardinals led by as many as six in the final stanza, but Gavin Larson of Pierce scored five straight points, including a driving basket with seven seconds to play that sent the contest to overtime. Henry, who led all scorers with 32 points, sank a 3-pointer in the initial overtime and had a chance to break a 58-all tie on a pair of free throws with 11 seconds remaining. The Card senior came up empty on the attempts, however, and the teams continued to a second extra period. Henry again hit from long range to put BCNG on top and a Weston Choat free throw gave the Cards a late 62-60 edge. Henry returned to the foul line with 18 seconds to play, but again missed both attempts and Larson took advantage, nailing a long 3-pointer for the win. Boone Central/Newman Grove reached the championship game with a clutch 58-55 semifinal victory over #2 seed Battle Creek, who had nipped the Cardinals 73-72 one week earlier. BCNG opened the Mid-State tourney with a first-round 62-55 Tuesday victory over O’Neill. Free throw shooting was the key for the Cards, who sank 11-of-14 foul shots in the fourth quarter to finish the game on a 16-5 run.